One-third of pilots surveyed by the Australian Transport Safety Bureau (ATSB) said they had removed themselves from duty because of fatigue at least once during the 12 months before they took the 2016 survey, the ATSB said in a report released Tuesday. “When they did this, they reportedly felt it left a negative impression with management,” ATSB Chief Commissioner Greg Hood said. 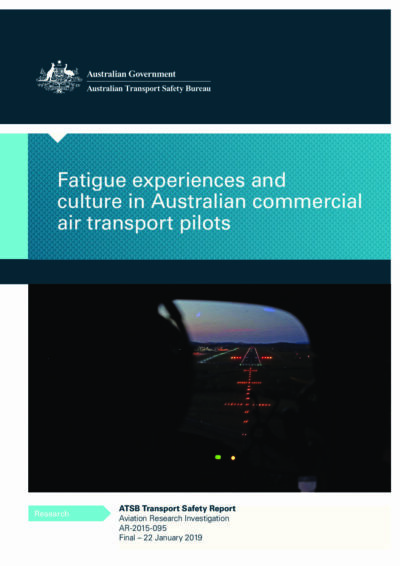 The report, Fatigue Experiences and Culture in Australian Commercial Air Transport Pilots, said that more than half of the 625 pilots responding to the online survey between June and November of 2016 said they had gotten at least seven hours of sleep in the previous 24 hours; more than 60 percent said they had slept more than 14 hours during the 48 hours at the end of their most recent duty period. Survey responses indicated that fatigue and fatigue-related issues were uncommon, although some pilots work in conditions that are conducive to fatigue. “While small in number, some pilots did report operating in conditions consistent with thresholds that have been showed to be associated with impaired performance due to fatigue at the end of their last flight,” Hood said. International and domestic jet airline pilots were more likely than regional, charter and aeromedical pilots to have obtained less sleep while on duty than during their time at home, the report said. One-third of respondents said they obtained the same amount of sleep at home as they did while on duty, about half said they obtained less sleep while on duty, and 15 percent of international pilots said they had no rest during their last international flight. The Australian Civil Aviation Safety Authority currently is consulting with industry representatives about introducing new fatigue rules in accordance with Civil Aviation Order 48.1, Instrument 2019, Modernising Australia’s Fatigue Rules. High capacity regular public transport operations are required to transition to the new rules by Sept. 30; other operators face a March 26, 2020, deadline. How a pilot speaks may help identify cases of fatigue and sleepiness, researchers say. Enough Rest for the Weary?